lollipop days: create! colour! go! A cool sack idea conceptualized by..... a mom! We totally love this Kidzsack - a fun, creative and eco concious product that mums and kids can just grab on the go. Manufactured using recycled fabric, the Kidzsack is offered with different screenprints for colouring. 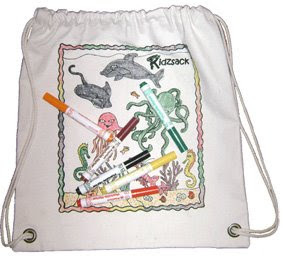 Each bag comes with 8 washable, non-toxic markers. Simply wash the Kidzsack and your kid can start over again. Sure to provide kids with hours of fun while mums can take some quiet break. Select from available designs HERE. We may just stock them at itsy bitsy ME! if there are enough interest. Leave your comments.